The White House and members of Congress have rejected a proposal by the Pentagon to reduce the size of the U.S. aircraft carrier force as part of its effort to reduce defense spending. As The Diplomat noted last month, the U.S. Department of Defense and Navy were considering mothballing a U.S. aircraft carrier in the FY 2015 defense budget as they strive to implement Congressionally-mandated spending reductions. The plan called for retiring the USS George Washington, a Nimitz-class nuclear carrier first commissioned in 1992, before its midlife refueling and refurbishing set to begin in 2016. Forgoing the refueling and refurbishing phase would have saved the Pentagon $4.7 billion, although this would be partially offset by the $1.2 billion cost of decommissioning the carrier. It would also have reduced the U.S. Navy’s carrier force to ten. This outcry from members of Congress from both parties put political pressure on the White House during an election year. Last week the U.S. Naval Institute reported, citing members of the Navy, that the White House had asked the Defense Department to look for other areas of the budget to cut spending. 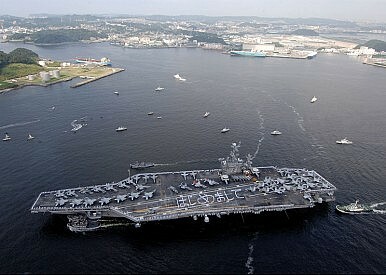 On Friday the Wall Street Journal reported that a deal had been reached between the White House and the Defense Department to forgo decommissioning the USS George Washington. Under the agreement, the White House has promised to provide the Pentagon with additional funds to pay for the carrier’s mid-life refueling and refurbishing. These funds would presumably have to come from the U.S. Congress, and in effect the deal promises to increase defense spending slightly. Still, the deal may only temporarily delay a reduction in the U.S. Navy’s carrier force as the Defense Department continues to search for places to reduce spending and a growing chorus of voices in defense circles question the need for an eleven-carrier force. In its strategic review last year, the Pentagon said that it would be able to operate with a carrier force of just eight or nine vessels. Four prominent defense think tanks in Washington, DC from across the political spectrum released separate plans this week outlining how they believe the Pentagon could best absorb the mandated spending cuts. All four plans included a reduction in the size of the carrier force. The Navy’s new training and deployment schedule also calls for only one in five carriers to be deployed at any given time, down from about one in three currently, which would seemingly minimize the actual impact of reducing the carrier force to 10.